Much of my musings on this blog are big picture ideas about the direction of classical music radio, but today, after sampling brief snippets of programming on streams from stations across the country, in large and small markets, I feel compelled to write about something very mundane: attention to detail in the studio. 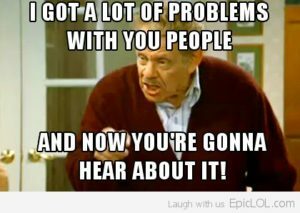 Consider this a Festivus-inspired, Frank Costanza-approved airing of grievances. What it really boils down to is taking care of the microphone. The microphone should only pick up the voice of the host, and nothing else. So often I hear the rustling of papers, the squeaking of a chair, mouse clicks, loud board buttons, etc. It sounds terrible. I know that not all ambient sounds are avoidable, but I hear a lot of carelessness in board operation on practically every station I’ve sampled. To be fair, I hear this on lots of news/talk stations, too (even from the NPR network), but hearing bad studio work after being entranced by an amazing piece of classical music is a tremendous killjoy that can be easily avoided. Much of this has to do with the timing of turning on the microphone fader and the subsequent operation of the fader once it has been turned on. I was fortunate to have strict training in board operation early on in my radio career. The mechanics I use are pretty simple: turn ON the microphone 30 seconds before I’m ready to speak, then move the fader up ONLY once I’m ready to speak (and not a second before), then move down the fader as soon as I am done speaking, turning it off if the break is over. Too often, though, I hear the microphone turned on when it shouldn’t be: too early, so when a piece of music ends, there’s an awkward pause (often with very audible breath/mouth noise); or too late: maybe you’ll hear more breathing/mouth noises, possibly accompanied by the sound of a mouse click, button being pressed, CD case being closed, whatever. When the microphone is on, things happen, too. I have heard what is obviously the sound of a host clicking through a website to read events from a calendar or a weather forecast, the rubbing of hands together (or worse, the nervous grooming of a mustache or goatee, which gives me the high-frequency heebie jeebies), and the movement of various paper materials around the radio console. These annoyances are borne of bad radio habits, but they are also indicative of lack of break preparation. If you don’t know what you’re going to put into a break a minute before the break happens, that’s not good. At least five minutes before a break, I look at the time relative to my playlist and any upcoming posts, and make a mental note of exactly how much time I need for the break and what I need to fit into it. I gather any materials I need and have them where they need to be so I don’t need to scramble and create noise during the break. So, fellow classical radio professionals, I beg of you: let’s clean it up. Station identities, music selections, and scheduling are topics for vigorous debate, but good radio studio habits and professional sound are not. Hmmm…I’m sitting in my room, car, and listening to a (hopefully) live human talking to me, one-to-one, sharing about a piece of music they just played. I don’t mind what would be “work noises”, I believe you’re overthinking it. I expect that on this end. (sans the grooming…or gawd forbid, eating, agree with that!) What I can do without is poor mic techniques (popping Ps, Bs, other plosives) and noisy air vents, as that is just avoidable by a wind screen and the mic processor set to gate (silence-mute) at room level ambient noise. And yes, I’ve been doing this for 45 years on AM/SW/FM with mics $49 from RS to Telefunkens @. $6900.